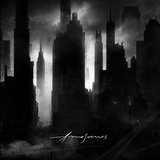 French mastermind Neige has been making depressive black metal with his main band, Alcest, for almost a decade, but the decidedly more post-punk-influenced side of his songwriting found an outlet in the side-project Amesoeurs. Drawing more from atmospheric groups like the Cure and shoegaze bands like My Bloody Valentine than from classic black-metal acts, Amesouers focused on creating a sound that reflected the grim and bizarre reality of post-industrial life. Severely limited by scheduling conflicts, divided attentions, and personal tensions, the band rarely played live shows and split after releasing one full-length album.